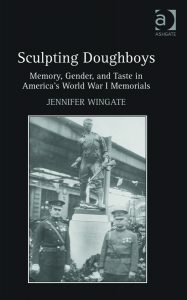 Jennifer Wingate’s book, Sculpting Doughboys, examines the popular form of doughboy memorials, which were dedicated in numerous communities throughout the United States in the decade following World War I. Doughboys, a name given to both the soldiers in the American Expeditionary Forces and their sculptural representations, were depicted most often as virile young men in uniform in alert or fighting stances. As Wingate asserts, the doughboy at once represented the individual soldier returned from the front, and all of the soldiers who died in battle (over 100 thousand American troops), many of whom were buried in Europe. Often mass-produced, they were erected in towns and cities around the country by the hundreds, but to date almost no scholarly attention has been paid to them. Although ostensibly about memorial making almost a century ago, Wingate’s study provides an important cautionary tale about the ongoing relationship between cultural memory and commemorative monument making, especially in the wake of 9/11 and two subsequent wars. The author reminds us in her introduction that the Great War became the “Forgotten War” in the decades following World War II. Lacking decisive battles, and a precise beginning and end, the war prompted unsettled memories of loss, and harsh critiques of its purpose, management, and aftereffect. Because of such ambiguous attitudes towards World War I during the second half of the twentieth century, we may not realize how pervasive commemoration of this war and its soldiers in America actually was. But ignoring these monuments, the author argues, “…fosters the cultural amnesia that has contributed to an explosion of war memorial dedications in recent years…”(5) Further, by studying ways in which Americans sought to memorialize the conflict in its immediate aftermath, much may be learned about the legacy of memorial making, as well as the development of American art, culture, and cultural criticism during the interwar period. Sculpting Doughboys is part of a much larger body of scholarship on war monuments and memorialization, and Wingate deftly pulls from a number of recent studies, including Steven Trout’s numerous publications on the First World War, particularly his work on the oftentimes grass roots nature of commemoration during the interwar years. Erika Doss’ investigation of America’s ongoing obsession with memorialization is also relevant to Wingate’s study, as is Kirk Savage’s extensive work on commemorating the Civil War; Savage’s most recent book chronicles how memorial making has transformed the National Mall. Wingate also draws upon the work of architect Andrew Shanken, who has examined the relationship between memory and the built environment, as well as that of Lisa Budreau, whose work sheds light on the often tense political landscape of commemorating fallen soldiers in the aftermath of World War I. Wingate’s volume adds to this impressive body of scholarship in that it helps to debunk the notion that although memorials abound in Europe, America lacks such commemorations. Sculpting Doughboys introduces the reader to the most prevalent form of the doughboy: the single soldier, who is young, masculine and attentive. At the outset, Wingate poses an important question: Why were these active soldier memorials so popular in America, while in Europe war memorials most often embodied a mournful or somber tone? In order to understand the doughboy’s popularity in the American context the author situates the sculptural form in a number of interrelated historical and cultural contexts; in an analysis of a single doughboy, she may bring to bear everything from small town politics, artistic authenticity and originality, the role of public sculpture in society, popular entertainment, immigration, the red scare, nationalism, concerns of masculinity and health, the women’s movement, and the difficult task of demobilizing the troops at the war’s conclusion. The sheer comprehensiveness of this book is undoubtedly one of its strengths, but it also poses a challenge from an organizational standpoint, because each doughboy had a specific relationship and function within its own local community. For example, in some places, in addition to memorializing lost troops, alert and “watchful” doughboys were symbols of America’s vigilance against the spread of communism, radical feminist movements, or immigration. At the same time, the athleticism of the doughboys, some of whom were modeled after Charles Atlas, provided a comforting vision of manhood in the wake of the war when battered troops returned during the flu epidemic of 1919 –a health crisis that proved more deadly than the conflict itself. But in spite of the lack of a streamlined narrative (indeed, probably an impossible task given the subject matter), Wingate’s book is neatly divided into five chapters that seek to cover specific aspects of the doughboy phenomenon. Chapter one examines the most prevalent form of the doughboy: the vigilant or fighting young soldier, whose image served as a model for American masculinity, a stereotype that also appeared throughout popular visual culture. Chapter two outlines the critical reception of the doughboy monuments from art critics, many of whom were alarmed by the rapidity at which the sculptures were erected by local governments, and who questioned their status as “high” art. In chapter three Wingate highlights some of the memorials that challenge the triumphant ideal of the doughboy, such as the solemn or mournful soldier, types that were often personalized for the community in which they were commissioned. In chapter four, Wingate directs her discussion away from the doughboy, and describes some of the alternative memorial types, such as allegorical figural monuments that sought to convey more pacifist messages. The final chapter is a thought-provoking conclusion in which the fates of some of these memorials are traced. In each chapter, the doughboys are analyzed formally and iconographically, shedding light on intended meanings of the memorials for contemporary audiences. Such analysis calls for clear and ample photographs of the monuments, and one drawback of this publication is that many of the illustrations are too small or indistinct to decipher details, causing the reader to take on faith Wingate’s reading of the works. An important theme that runs throughout this book, and that is still debated today, is how the concepts of “high” and “low” art are played out in public sculpture. What role should an artistic elite play in determining what art forms are suitable for public monuments? No easy answer presents itself, then or now. A readily manufactured doughboy was a viable memorial option for local communities, who often lacked both extensive funds and artistic expertise. Thus, the ubiquitous form of the doughboy, ordered straight from the manufacturing foundry, conveyed reassurance; familiarity with the form was more desirable than originality. But as Wingate points out, this very sameness of the doughboys led to a desire to personalize them, thus making them more “authentic” by adding the names of dead and missing soldiers to the sculpture. Thus, as Wingate and others have observed, it was only after World War I commemorations that war memorials began to shift from hero to victim monuments, a tradition that paved the way, although not without controversy, for Maya Lin’s Vietnam Veterans Memorial, dedicated on Washington, DC’s National Mall in 1982. While Wingate analyzes the various forms of the doughboy, she also notes the importance of who made them, and an enlightening aspect of this study is the inclusion of art makers who are often left out of art historical literature, such as women, immigrant artists, and commercial foundries. Indeed, the bottom-up nature of most World War I commemorations allowed for artists working outside of traditional art institutions to obtain commissions. In the first two chapters, Wingate places the doughboy into the context of the immigration strife of the interwar period. At a time when the country was passing the strictest anti-immigration laws in its history, immigrant artists often faced nationalistic and racial prejudice. She traces the strategies utilized by these artists to emphasize the “Americanness” of their particular doughboy designs, which were not modeled after actual soldiers (many of whom were themselves immigrants) but football players and other athletes. Even in the face of such nationalistic fervor, new modes of advertising on the part of immigrant sculptors and foundries created a space for previously marginalized artists to get work. Until recently, little attention has been paid to women’s participation in monument making, and chapter three is largely dedicated to the role that they played in the realm of public art at the time. Not only were they instrumental in helping to raise money for local memorials, some worked to design and create monuments. Wingate argues that because women artists were often relegated to the periphery of the mainstream art world, they were able to take more artistic risks than their male counterparts, and as a result, many of their works subtly subvert and complicate the militaristic symbolism of the doughboy model. Thus, many of the monuments by women are more contemplative in nature, such as memorials to peace, depictions of nurturing and mourning mothers, and allegorical nudes. The figures in this lesser number of memorials represent a small, yet vocal, pacifist movement. Indeed, it was this pacifist movement that was associated with both the women’s movement and the Industrial Workers of the World, who were pitted against the American Legion in the years just after the war, in a violent and public conflict that contributed to the doughboys’ popularity. Another strength of this book is its conclusion, in which Wingate summarizes more recent patterns of war commemoration, such as the continuing relationship between monument making and tourism. The author also poses important questions regarding the continued relevance of memorial monuments, whose individual meanings and functions may have evolved over the years. She traces the fates of several of the memorials erected during the interwar period, an examination that reminds us that these “permanent” markers of patriotism and sacrifice often function in different ways almost a century later. As cities and neighborhoods evolve, affecting everything from traffic to demographic patterns, so do the meanings of these monuments. Erected as a tribute to a particular community’s sense of loss during and after the First World War, how do such memorials relate to contemporary audiences? How do the doughboys continue to “live” within their current communities, and how might their relocation impact a community’s relationship with them? As Wingate argues, the process of finding meaning in these doughboys, whether we regard them as “kitsch, relics, patriotic tributes, or works of art,” (205) will hopefully lead today’s viewers to a more nuanced understanding of commemoration and memorial making both then and now.